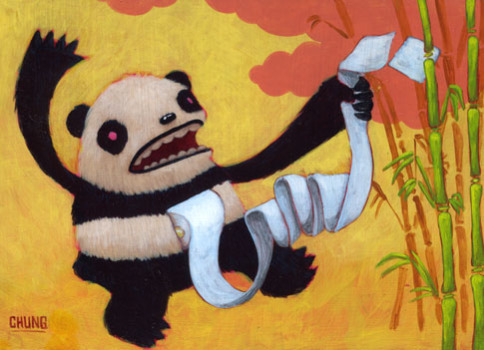 If you thought playing around with panda droppings is an ignoble thing to do, you'd be right. Do it to extremes and you might just win an Ig Noble Prize, science's version of filmdom's Razzie awards. We can only hope that the research team from Kitasato University in Tokyo consisting of Fumiaki Taguchi, Song Guofu, and Zhang Guanglei washed their hands before thanking the presenter of their Ig Noble Prize in biology. 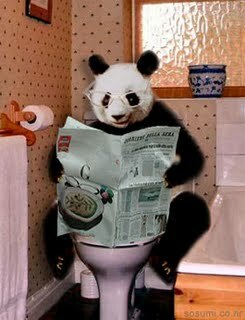 Of course, Taguchi and Co. had a firm purpose in mind when they first decided to dig into the mysteries of panda dung. They weren't actually interested in the droppings themselves - they just came with the territory - but the microscopic bacteria residing within. Like all dung, panda excrement is made up mainly of bacteria (most of it dead) which formerly made their home in the furry creature's gut and helped it digest the approximately 20-30 pounds of bamboo it downs each day. Giant Pandas space out all that eating with excreting - like 40 times a day, according to Poo News (yes, there is such a site - and you think I'M obsessed). The researchers figured that panda's intestinal flora must be mighty powerful... YOU try eating a bushel of bamboo; think your puny posse of E. Coli could handle that job? After teasing about 270 different kinds of bacteria out of fresh & fragrant panda dung and testing their ability to break down protein and fat at high temperatures, five especially powerful cultivars were isolated and cultured. When sicced onto about 200 pounds of organic garbage and gently shaken (not stirred), the panda protozoa reduced its volume by an incredible 96% leaving nothing more than water, CO2 and some sludge. There's got to be a market for the latter, by the way, since dollar stores do a roaring business selling all kinds of fake crap. In any case, Taguchi and his intrepid team of researchers deserve credit, not catcalls, for uncovering a novel method of decomposing residential and commercial organic waste in situ, thus lightening the load on landfills. And the Ig Nobel Prizes? 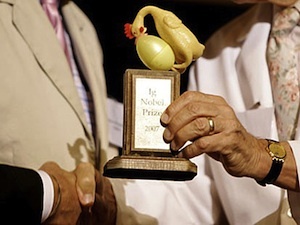 According to the award's originators at Annals of Improbable Research magazine, the intent of the annual awards is to recognize scientific achievements that "first make people laugh, and then make them think." You can read the official, technical report on "Microbial treatment of kitchen refuse with enzyme-producing thermophilic bacteria from Giant Panda feces" - whew, that's a mouthful (gag) - at the Science Direct website. (via Pink Tentacle and Ars Technica).